Eric Molina wants to make history as first Mexican heavyweight champ - how about a return fight with fellow Mexican/American Chris Arreola first? Eric Molina wants to make history as first Mexican heavyweight champ – how about a return fight with fellow Mexican/American Chris Arreola first? 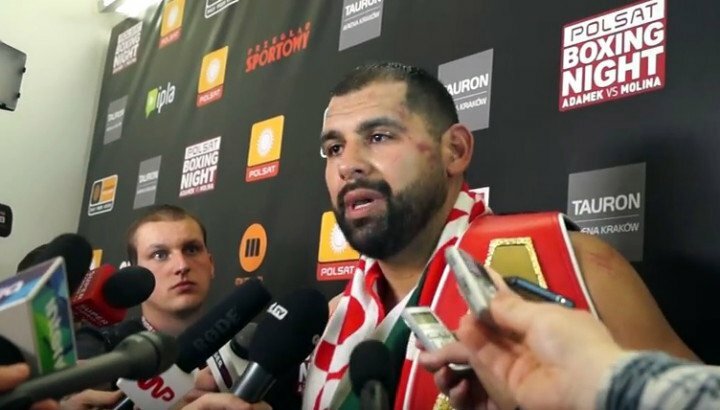 Proving that nice guys, and very hard working guys, can finish first, 33-year-old Eric Molina traveled to Krakow, Poland and scored the biggest win over his career at the expense of Tomasz Adamek last night. The Mexican/American known as “Drummer Boy” landed a booming right hand to head to take out of the former light-heavyweight and cruiserweight king; picking up the biggest win of his career to date. Molina, who gave reigning WBC heavyweight ruler Deontay Wilder both a scare and a good fight when he challenged him back in June of last year, now wants a second crack at a world title. Molina wants to make boxing history by becoming the first ever Mexican to win a heavyweight world title and he has, on the back of his good win, called out the winner of the still to be fought Charles Martin-Anthony Joshua IBF title fight. Molina is deserving of a big fight down the road, but for fans who feel the 25-3(19) contender needs to do a little more before walking into a second world title fight, here’s an idea: how about an Eric Molina-Chris Arreola II? The knock on Molina, upon challenging Wilder, in Wilder’s first title defence, was his February 2012 loss to Arreola – a 1st-round stoppage loss. The loss has bothered Molina ever since and a return meeting between the two would surely prove a sellable, interesting fight. Arreola, who lost a decision to Adamek back in 2010, also harbours ideas of becoming the first ever Mexican/American heavyweight champion. If Arreola and Molina were to fight a rematch, perhaps the winner – if he won in exciting fashion especially – would convince fans he deserves another chance to go into the history books. If nothing else, Molina-Arreola II would be a solid match-up between two proven punchers who have a history. Molina would get the chance to avenge his most damaging (to his reputation) defeat, while Arreola, who has struggled to look good in his last three outings (despite not losing either of these three bouts) would get a chance to put another impressive KO win on his record. But who would win if these two sluggers fought again? Molina has looked far better than has Arreola just lately, his win last night a result of his hard work, self belief and power, and maybe he would reverse the loss he suffered four years ago. Or would Arreola, 36-4-1(31) put in the hard work in the gym himself and repeat his crushing win? The winner of this possible fight would move on to bigger things, while the loser would probably have to look at calling it a career, especially if it were Arreola. High stakes indeed, but that’s what the fans love the most about a match-up. Who wouldn’t be interested in seeing this rematch? Next boxing news: Anthony Joshua responds to Tyson Fury criticism: Who does Fury kid himself he is – the second coming of Sugar Ray Robinson! You are here: Home / Boxing News / Eric Molina wants to make history as first Mexican heavyweight champ – how about a return fight with fellow Mexican/American Chris Arreola first?